Looking for some apps to make your Decatur lifestyle even easier? 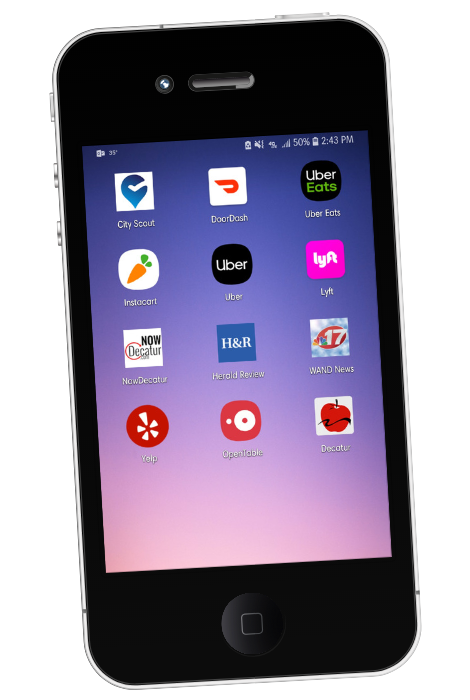 Check out the list below to access apps packed with news for locals as well as a great selection of food delivery and transportation options, dining recommendations in the area, events, and much more! Have a personal favorite that you don’t see below? Let us know! Use this Decatur app to find some of the best local businesses, local eateries and attractions. The app features hundreds of dollars in savings at local businesses with the Coupons/Rewards section. Download the app in the App Store or the Google Play Store today by clicking the links below or searching “City Scout Decatur”. Hungry? Get the food you want, from the restaurants you love, delivered at Uber speed. Eat what you like, where you like, when you like. Find the local flavors you crave, all at the tap of a button. Get groceries delivered on demand from your favorite supermarkets in as little as an hour. Shop for all your groceries online with the Instacart app and get fresh local produce, organics, meat, dairy, eggs, drinks, snacks, bulk items, diapers, snacks, fresh flowers and much more. Uber is a ride-sharing app for fast, reliable rides in minutes—day or night. There’s no need to park or wait for a taxi or bus. With Uber, you just tap to request a ride, and it’s easy to pay with credit or cash in select cities. Need a lift? Use Lyft to get an affordable ride in minutes. Ride sharing with Lyft lets you request a car with the tap of a button and get picked up by a nearby friendly driver who’ll take you to your destination right away. Get rides from our highly-rated drivers instead of hailing a cab or waiting for the bus and enjoy a welcoming, affordable and memorable ride today! With the NowDecatur app, you can stay connected to everything that is happening in Decatur, Illinois. NowDecatur is your local source for news, sports, weather and so much more. The Herald & Review provides continually updating news, weather, sports and more local information from around Decatur, Illinois. Read and view the latest news, photo galleries, and video on local topics including politics, sports, entertainment, obituaries and more. Get local weather forecasts and current conditions. WAND is your Central Illinois station providing the most accurate news, weather and sports coverage. This app keeps you informed while you are on the go. Discover great dining experiences and make free restaurant reservations at more than 43,000 restaurants around the world. The perfect travel app to dine like a local, find restaurants by location, cuisine and more plus get personalized recommendations based on your preferences. View photos, menus and reviews to guide your picks. Every time you book and dine, you’ll earn rewards for future meals. The Decatur Public Schools app gives you a personalized window into what is happening at the district and schools. Get the news and information that you care about and get involved. Remember to stay engaged with Limitless Decatur & Macon County on our social media channels below.